Houseplants not only beautify a home, but also help eliminate harmful air toxins. Usually houseplants are sold with tags showing a plant’s name and instructions on how to care for it. On the other hand, sometimes nurseries don’t reveal the name of the plant. Because leaves are easily visible, they often provide the key for identifying a particular houseplant so you can give it the care it needs. It’s helpful to recognize the three main parts of leaf when identifying a houseplant. The blade, the most obvious part, is the flat leaf portion. The petiole, when present, is the stalk that attaches the blade to the stem. The stipule, which looks like a leaf, lies at the bottom of the petiole where it attaches to the stem. Leaf shape provides significant clues to a houseplant’s identity. Philodendrons are an example of a houseplant with heart-shaped leaves. Palm-shaped leaves are shaped like a palm on a human hand and have thick fingers that originate from a leaf’s center. Just like most palms, the canary creeper is an ideal example of a palm-shaped houseplant, says the website Caring for Plants. The type of leaf arrangement on a stem gives helpful hints in determining the identity of a houseplant. In opposite leaf arrangements, as found in many mint plants, leaves grow in pairs, sprouting in opposite directions from a node on a stem. An alternate leaf arrangement, such as seen in ivies and climbing plants, is where a single leaf is attached to each node with the leaves alternating. 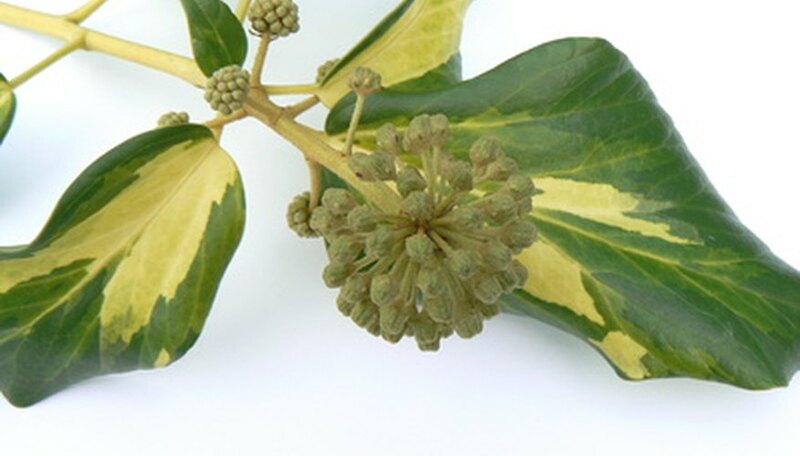 Whorled leaves are three or more leaves that are attached to each node, such as whorled peperomias, notes Caring for Plants. Leaf form is another clue for identifying houseplants. Simple leaves have a broad leaf on a petiole or leaf stock. Examples of houseplants with a simple leaf form include crotons, philodendrons and corn plants, according to Caring for Plants. Compound leaves are divided into smaller leaflets. They can be a pinnately compound, in which leaves all originate from a main stem, or a palmately compound, in which leaves all start from a common point, rather than along a stem. While ferns are common examples of pinnately compound leaves, the dwarf schefflera is a typical houseplant with palmately compound leaves. All leaves on a given plant don’t necessarily look alike or have the same sizes, cautions the Oregon State University website. Variations may occur in color, size or shape. For example, leaves receiving more sunlight can appear different from shaded leaves on the same plant. Examine many leaves when trying to identify a houseplant and try to decide what’s considered a “typical” leaf.